Naval Air Station Barber’s Point was commissioned on April 15, 1942. NAS Barber’s Point was named after Captain Henry Barber. On a voyage to China in 1796, Captain Barber, commanding the British brig Arthur, called at Honolulu for supplies. He left Honolulu about 6 p.m., October 31. At 8:10 p.m. Barber’s ship struck a coral shoal to the west of Pearl Harbor. TheArthur cleared the shoal, but was driven on the reef and broke up. Captain Barber and his crew of 22 men took to the life boats. Six drowned. The survivors landed near the point which ever since has been named after Barber. The Hawaiian name for this isKalaeloa which means long cape (headland). Originally the only air activity in the immediate surrounding area was the Ewa Mooring Mast, located there for a number of years, and built in the early 1930s for the use of the dirigible Akron. This mooring mast was erected on a plot of land approximately 3,000 feet by 3,000 feet on land leased from the Campbell Estate. The rental fee was moderate, with one stipulation: the area could not be fenced so that cattle that roamed the area could eat the beans that fell from keawe trees in the area. The complete lighter-than-air mooring mast and appurtenances consisted of a 10,000-gallon storage facility for aviation gasoline; a small telephone line, 2-inch water pipe from the Ewa plantation, and a machinery house consisting of the necessary machinery to moor the airship. About 1932 the mooring mast was cut down to the so-called stub-mast and so remained until its eventual dismantling in May 1942. No records were found indicating that a dirigible was ever moored at Ewa mooring mast. Some time during the years 1939-1940 the lease to this small tract of land ran out. Negotiations were started for the acquisition of about 7,000 acres of land surrounding the Ewa mooring mast. The idea was to divide the land in such a way as to make part of it into an emergency landing field, and the remainder into a bombing range. This didn’t happen but eventually 3,500 acres was acquired. The land was then built into two stations, the Naval Air Station Barber’s Point, the larger, and the Marine Corps Air Station, Ewa, the smaller. On July 12, 1940 an order was received from the Pacific Naval Air Bases for a survey of the land and investigation for a fresh water source. Preliminary plans for NAS Barber’s Point were issued in October 1941. Field work started in November 1941 and the station was established on April 14, 1942. It is believed that there was emergency use of the landing strip of the Ewa Mooring Mast field, before the Marine Corps Air Station was officially established on September 1, 1942 and the NAS Barber’s Point was actually commissioned on April 15, 1942. The original layout for Barber’s Point was prepared by the design section of the 14th Naval District Public Works Department. At the outbreak of World War II, work had only just begun on the NAS; all work was halted and every effort was expended to make the Ewa field as operational and extensive as possible due to the scarcity of some building materials. When enough barracks and other living and working facilities were completed, work at the present Barber’s Point NAS was continued in earnest. When it was decided that there would be two stations there, the Navy determined the boundary lines between them by drawing two lines, one of which ran about 40-feet east of the incoming railroad tracks. The other line connected with it in a southeast direction. The Navy authorized the NAS to supply facilities for land base operations of two Navy aircraft carrier groups. 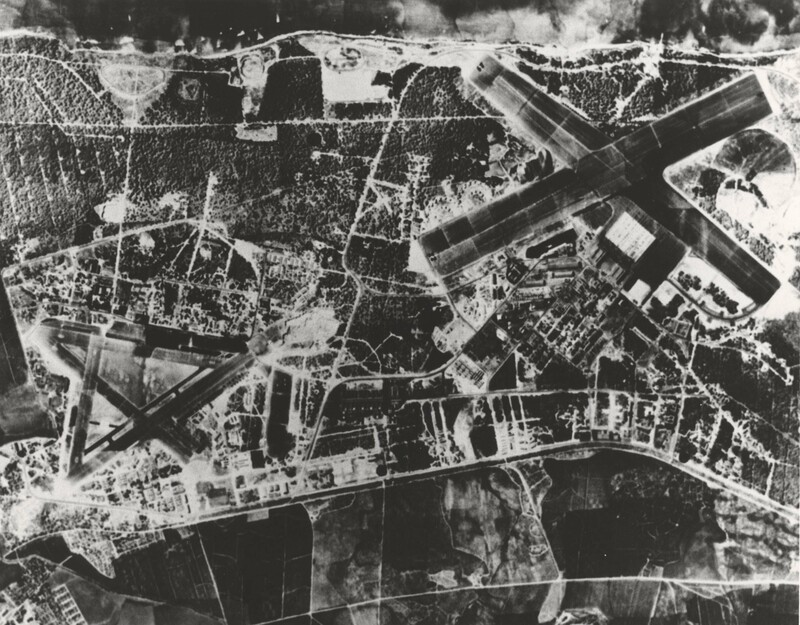 Included were land runways, two hangars, necessary shops for storage and utilities and accommodations for 2,000 enlisted men, 250 officers, and 800 civilians. Barber’s Point was originally designed as an auxiliary or outlying airfield of the Fleet Air Base at Ford Island. Following the outbreak of World War II, additional authorizations were issued which increased the station’s capacity to sustain four carrier groups. Additional magazines and training facilities were also added. The size of runways and plane parking areas was also increased. Additional nose hangars, parking areas and a progressive engine overhaul shop were added. This engine overhaul shop was the Navy’s first mechanized progressive engine overhall. On October 30, 1944, the first engine came off the engine engine overhaul line, a 2,000 h.p. radial type engine. The unit handled the largest engines used by the Navy and required the services of 850 men. The minimum time required for an engine to go through the mill was about 10 days. In April 1945, 261 major engine overhauls and 11 minor overhauls were accomplished. On July 24, 1944, the Commander of the Naval Air Bases, established a facililty for open parking of preserved aircraft, as an activity of the NAS Barber’s Point. An area of 150 acres at Iroquois Point was established for this purpose. The primary mission of Barber’s Point in 1945 was to maintain and operate a base for Naval aircraft and aviation personnel, providing facilities for operation, berthing, supply, servicing, overhaul, storage and repair of aircraft, and for the quartering, messing and training of personnel. Early in the career of Barber’s Point, there were Army fighter squadrons based there, whose duty was to protect that part of the island. They were on a constant alert status. As time went on, the squadrons were removed. The Bureau of Aeronautics recommended that Gunnery Facilities be set up at NAS Barber’s Point and this was accomplished in July of 1943. Originally the unit was designated as an Aerial Free Gunnery Unit but the name was changed to Combat Aircrew Training Unit about November 1944. The Inspector General Pacific recommended that crowded conditions at Ford Island be relieved by moving the Inshore Patrol squadrons to Barber’s Point. This involved moving 82 officers, 390 men and 48 planes. This not only alleviated crowded housing and messing facilities, but also eliminated the dangers of landing and take-off of bomb-loaded aircraft at Ford Island on daily missions of the squadrons. Operations were conducted on a 24-hour basis: carrier landing practice during the day and attack and combat practice and carrier landings at night. The main runway at Barber’s Point is 1,000-feet wide by 8,300-feet long, and the cross runway was 750-feet wide by 8,400-feet long. Barber’s Point was decommissioned by the Navy in 1998 and turned over to the State of Hawaii for use as Kalaeloa Airport. Today Kalaeloa Airport (JFR) consists of 757 acres and is used as an alternate landing site for Honolulu International Airport and for general aviation purposes. It has three paved runways, 8,000 feet x 200 feet, 4,500 feet by 200 feet and 6,000 feet by 200 feet.